The first things finished were these reversible tote bags for a friend's sister-in-law's toddler. I had planned to use a lightweight iron-on interfacing, but was out and it was blizzarding that day, so I used the sew-in heavyweight I had on hand. I really like how sturdy they turned out. A friend got married the week before Christmas (coincidentally, she's also related to the purse orderer), so I made a gift bag and tied on this cute ornament that I thought was fitting for a December wedding. 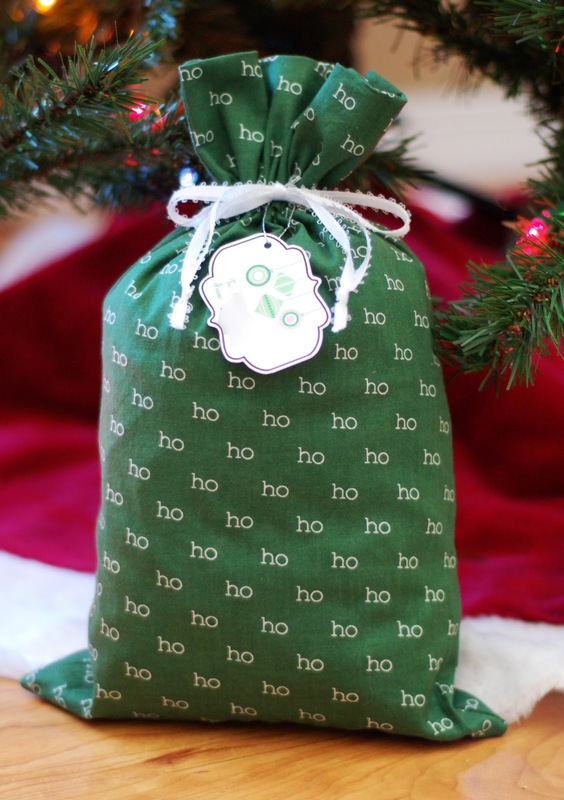 I usually make gift bags with a drawstring, but tacked the ribbon on the back of this one. I like how it turned out, and will use that method for younger kids from now on, since it's easier for them to open. If you're following the time-line here, it's now a week before Christmas, and I haven't yet made a thing for my own kids. 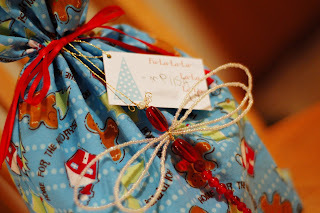 But there are therapist and teacher gifts to make first.... E. has a team of three therapists and an early childhood teacher who each come to our house twice a month. They used to come weekly, so they're a big part of our lives. I made them granola, using a tweaked version of this recipe. 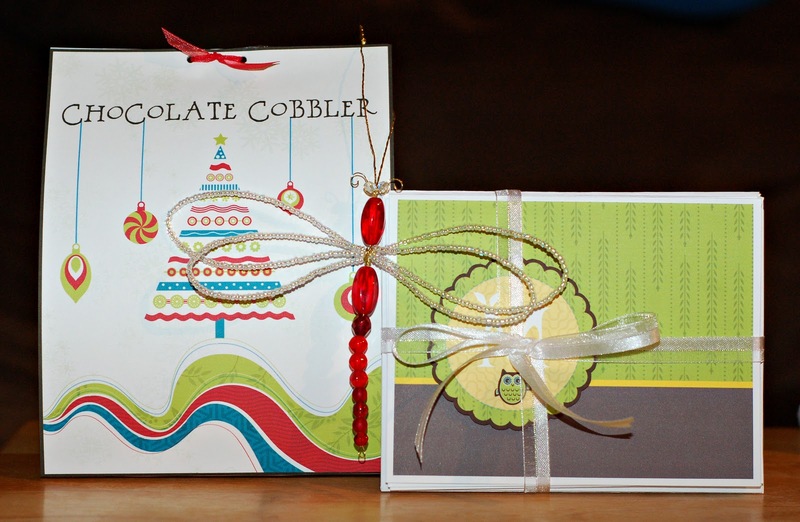 I found printable labels and then made gift bags. Next up was O's teacher. I asked him if he had any ideas, and he said she likes dragonflies and tacos. Helpful. We spent some time looking at beaded dragonfly tutes to make an ornament and settled on this one. I changed some things to use beads from my stash and added beads to the wings to make them stand out more on the tree. 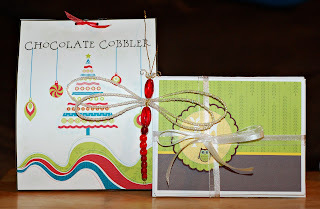 I also made some note cards and a chocolate cobbler mix from printables here and added a gift tag from here. Hooray for blogs! The cards have her first initial on them, which is hidden a bit by the ribbon. O. had originally picked out the following fabric for his teacher's bag, but I thought it might be inappropriate to give to a woman, so I strongly encouraged him to choose a more colorful print. I don't know how I didn't notice it before -- maybe because I'd used it for kids before? LOL I thought my aunt would think it was funny, so I made a bag for her from it. Isn't the spacing weird? I think it would have less insult potential if the words were grouped together like "ho-ho-ho" or something! He swore he needed a candy cane hat to go with it, so I showed him this, and while it wasn't exactly what he wanted -- which was something that looked just like the top of a candy cane! -- he thought it would work. 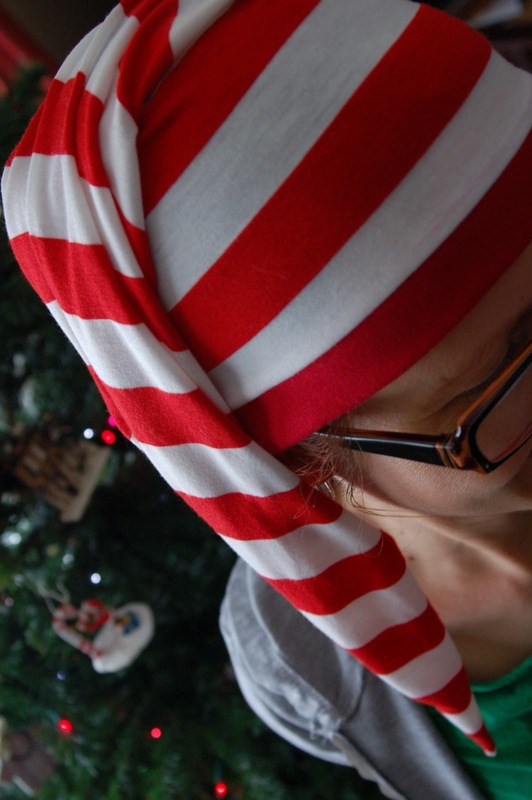 The he refused to have anything to do with it, so I wore it on Christmas Day. E's only handmade gift this year -- other than some of the playsilks from my last post -- was a fleece hoodie from this print I found at Hobby Lobby. The poor girl takes after her mother, who is always cold. 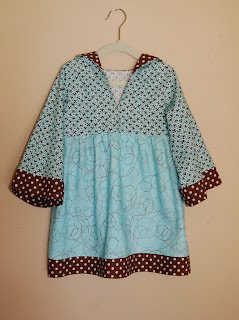 This is a T3 from Kwik Sew Sewing for Toddlers (or KSFT) which has horribly dated photos, but is great for basics. I added two inches to make it more of a tunic length. 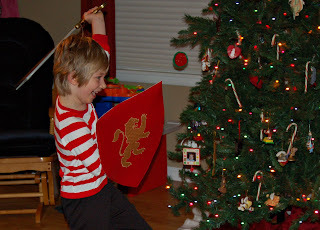 O. requested two things: a lion knight shield and a hat that looked like a police helmet. 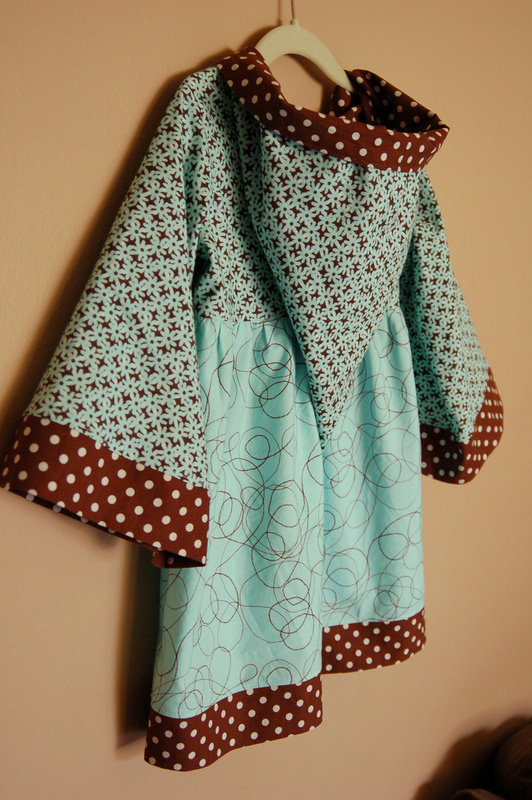 One of the coolest things about being a sewing mama is that your kids think you can make anything, but it's a bit of a double-edged sword. Hee. 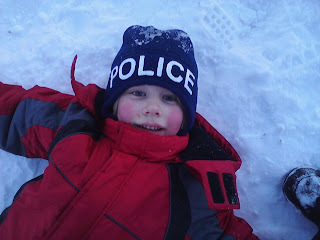 The police helmet was a little tricky. 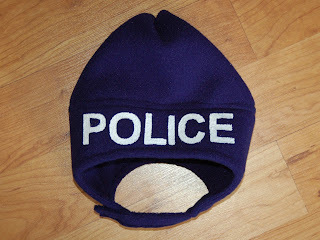 He suggested that I make it like E's fleece hat, from the Rainshed Convertible Bomber Hat pattern, but I wasn't sure how to get the word on it and have it look nice. 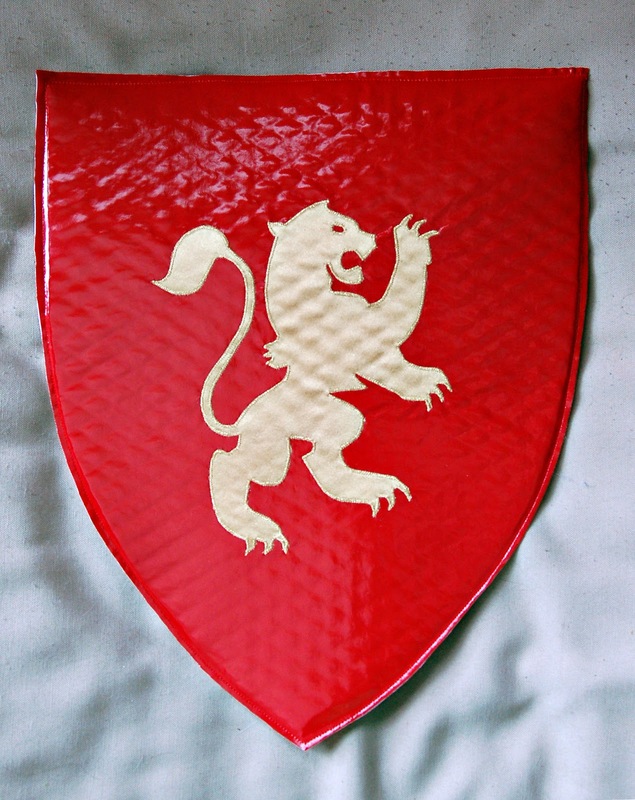 I'd had my fill of applique from the lion. My next thought was to try the freezer paper stencil technique, but was afraid that ironing it on would melt the fleece, so I decided to try using printable sticker paper. It worked pretty well. The edges aren't as clean and crisp as I'd like, but it looks pretty good from a distance. The lettering really is straight and even, it's just not flat in the photo. In retrospect, there weren't even that many projects -- although I sewed up several gift bags that aren't pictured and there were cookies to bake, etc. -- but considering most of them were crammed into one week, it was pretty hectic. Next year's my year! Yeah, right. Check back and I'm sure I'll be saying, "2012 is my year. I mean it this time!" Green: for two silks, 4 packets lemon-lime KA, 1 packet arctic green apple, a dab of sky blue Wilton icing dye. I had planned on using leaf green Wilton dye for these, but the container leaked all over and one of us must've thrown it out. I'd have liked to have a grassier looking green. Purple: 3 packets grape KA, 1 packet strawberry. This was my biggest dud, but it looks better now that it's rinsed out and dry. I was going for a brighter purple. Brown/Gold: for two silks, two five-cup pots of coffee + 1 quart of water. This is my favorite! It's a really pretty gold in person, a little lighter than the picture. It's getting cold! I knew it was coming, but was perhaps in a bit of denial. The girl and I needed some warmer accessories, so out came the fleece. 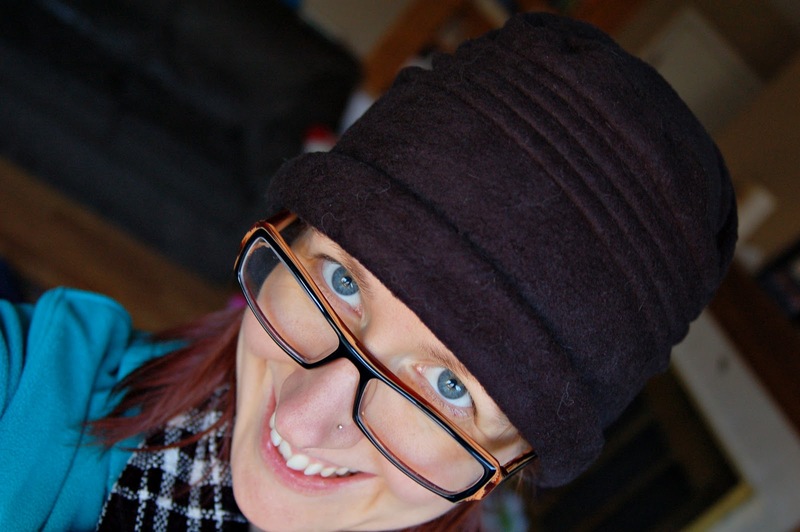 I needed a black hat to wear with my pink winter coat. 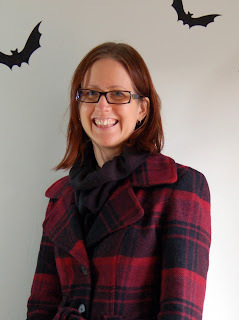 I've had the coat for a few years and can't figure out what I wore with it other winters! 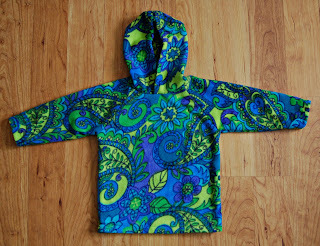 I guess the past two years I mostly wore my Mamajacket, but that has found a new home with another babywearing mama.... I've had my eye on the hat from Ottobre Woman 5/09 since it came out, so I traced it and went to work. It was pretty quick to sew. The tucks took a little bit of fiddling and I blind-hemmed it by hand, but it still was done in one nap, with time to spare. It's hard enough to get a decent self-portrait without having to worry about picking up the details on black! I'm not sure how I feel about the finished product. I'm not in love with it, but I don't know if it's the style or just that I shouldn't wear that much black by my face. Hmm. What do you think? On to the girl's winter wear. 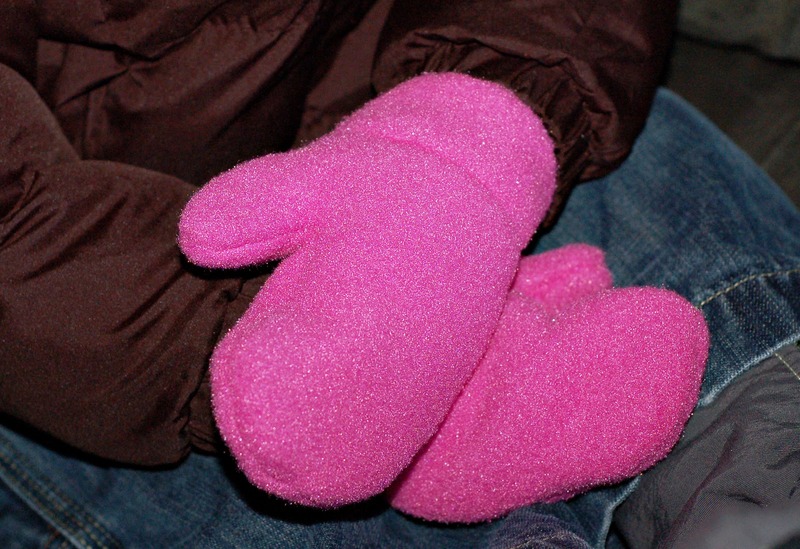 E. just had those cheapo stretchy mittens, because they're easy to get on her, but they weren't cutting it now that it's frigid. 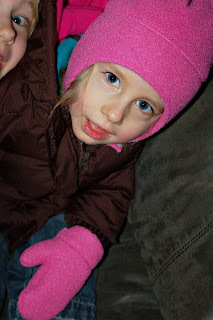 She needed something warmer for when we pick up O. and the other ones I bought her fell off after about thirty seconds. 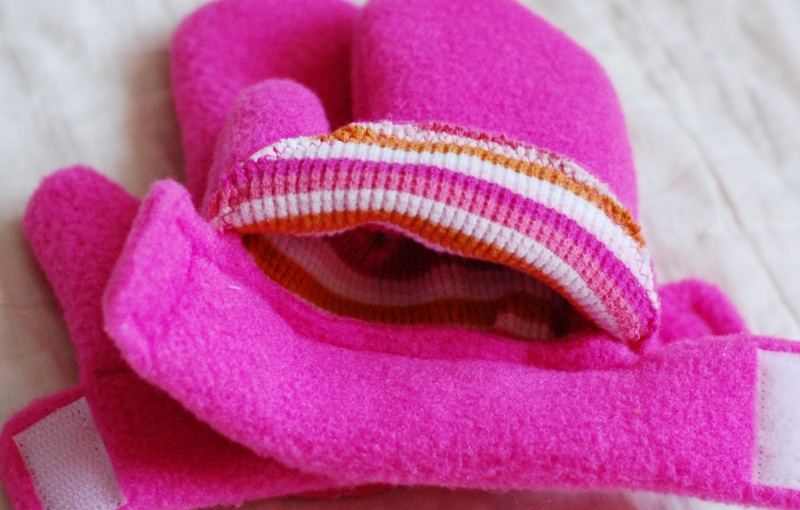 I was looking for something else and came across the Sew Baby Mitten Wraps pattern, which I'd totally forgotten I had (tells you something about my pattern stash!). 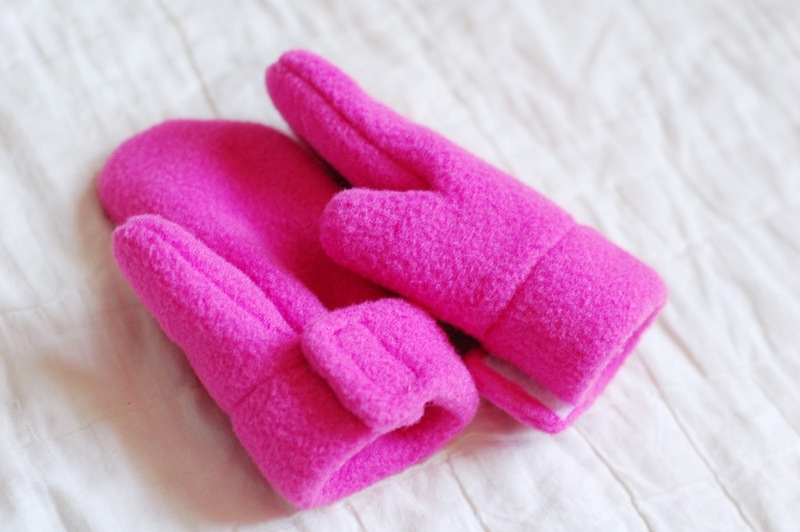 I'd originally bought it when O. was her age, but tried to make them from WindPro and thought that fleece was too thick and hard to work with for such small thumbs. This time I used 200 weight Polartec -- the same as her hat made two years ago (!) 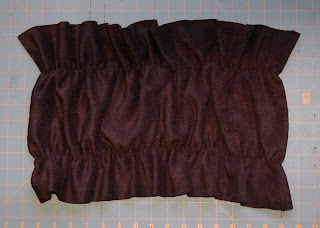 from the RainShed Convertible Bomber hat pattern -- lined with cotton thermal from one of her shirts from last winter. 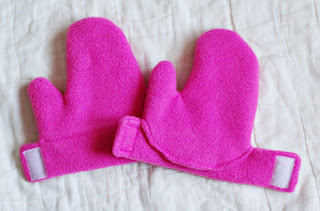 They're not an example of my best sewing, between the stretchiness of the thermal, trying to keep four layers together neatly, and hurrying because she needed them ASAP. That said, they are *so easy* to put on! She has sensory issues and doesn't like her hands touched, so getting her thumbs in the right spots can be tough, but these slid right on without her making a peep! O. has a serious case of crazy eye in this one. Ha!! O. and E. need more winter shirts, so I turned to my favorite pattern, the Patrick Curved Raglan, changing the sleeve to a solid long sleeve. I didn't make any other changes to the boy's. For my skinny girl, I used Bonnie's suggestion of tracing the 2T (a size smaller than her usual) in width and 3T in length. The cherry print is a super-stretchy rib knit that was a pain to sew, and my lettuce hems leave something to be desired. I should have either gotten some red Wooly Nylon to put in the loopers or just used white. I think it's pretty cute on her, though! This poor scarf has been on my needles since November 18, 2009! 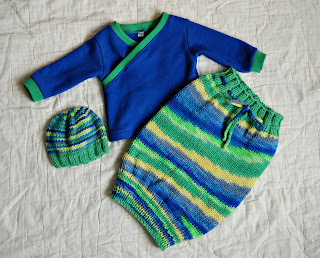 (Thanks to the awesomeness that is Ravelry, I know such specifics.) 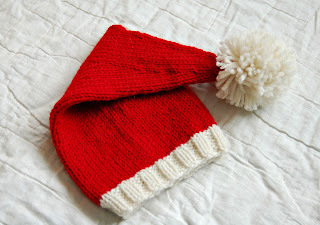 I meant it to be a Christmas present last year, but I think I got a bit burnt out after knitting the family hats over Thanksgiving weekend. I finally picked it up again a couple of weeks ago and finished it in a few evenings and a bit in the car this Thanksgiving. 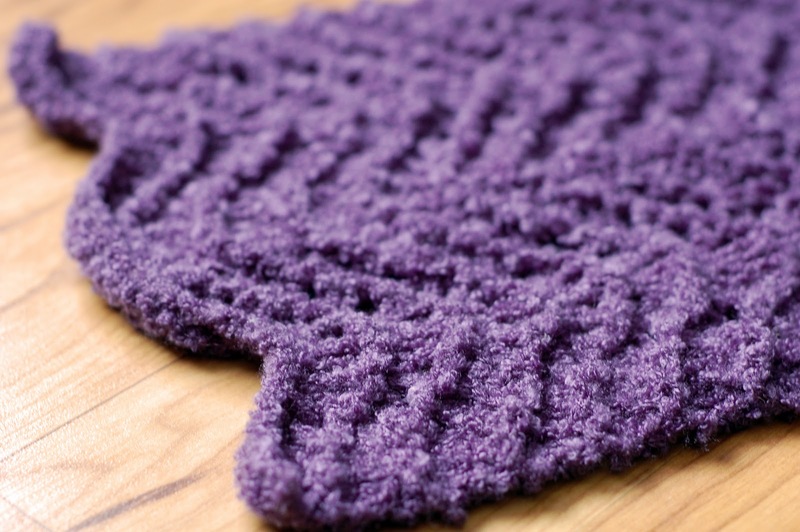 It's a feather and fan pattern, the Misty Garden from Scarf Style. It was easy to memorize and a relatively quick knit, if I had, you know, actually worked on it ever! 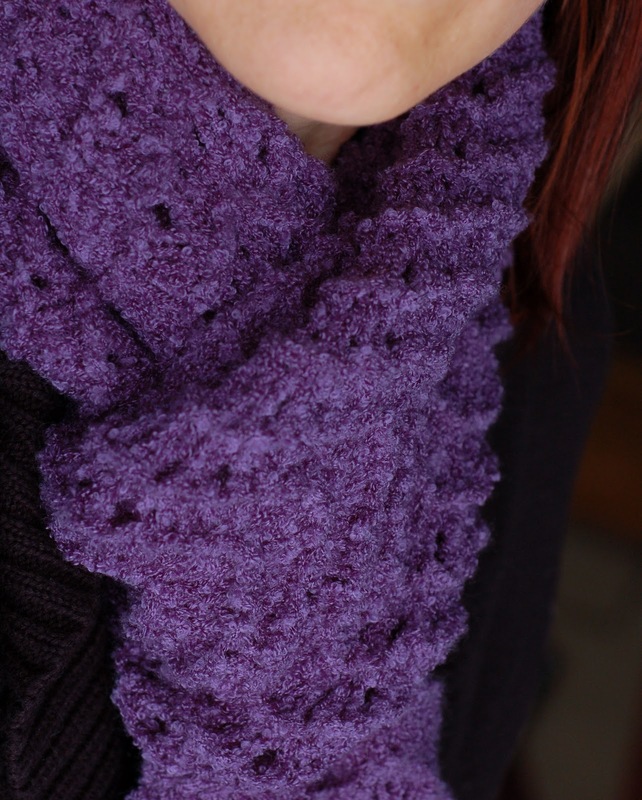 The pattern would show better on a less textured yarn, but I really like how cozy the TLC Amore is, and I think the recipient will like the color. It has occurred to me that I should wait until after the holidays to post this, but I'm just so relieved to finally have it done! Ha. Not much sewing going on here lately, although there has been pattern tracing, so hopefully I'll have some new stuff to show in a few days! 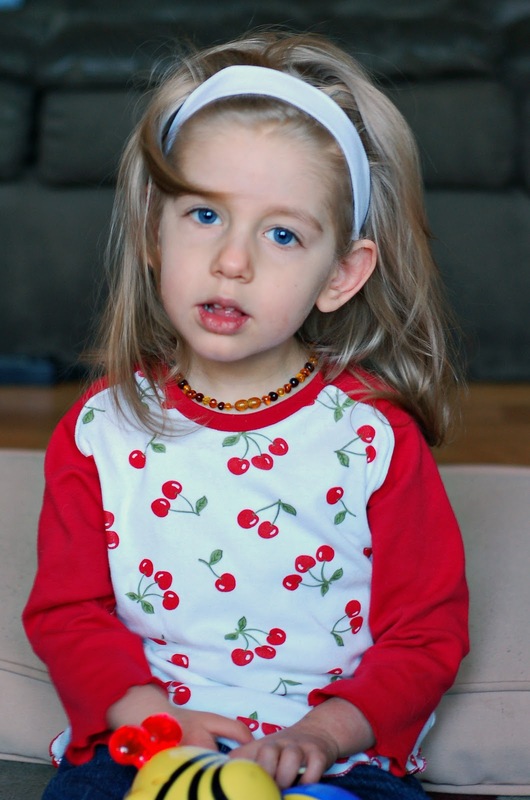 Last weekend we had family pictures taken, and I realized that morning that E. didn't have a matching hair bow. The horror, right? 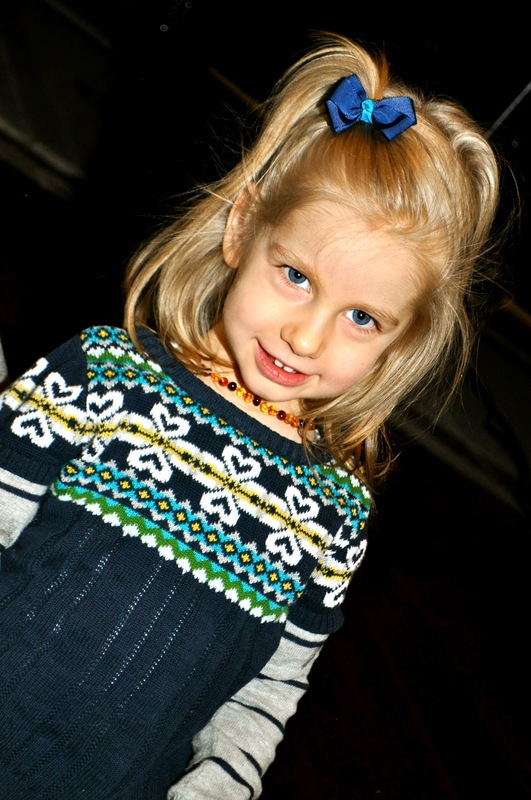 A little Googling and hot-gluing later, and she was perfectly color-coordinated. And I couldn't believe I'd never made them for her before! Easy and fun. I used the "Boutique Hair Bow" tutorial here. Yes, those are Halloween decorations still up! Want to make one too? Here's how. 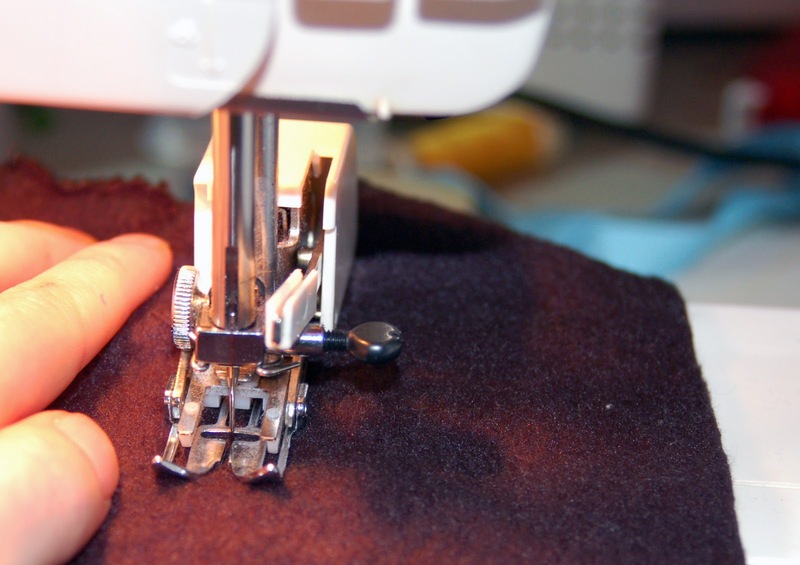 Cut your fleece into a 12"x32" rectangle, with the greater stretch going lengthwise. I wanted mine to fit fairly close to the neck, but if you want a more dramatic cowl, cut it several inches longer. 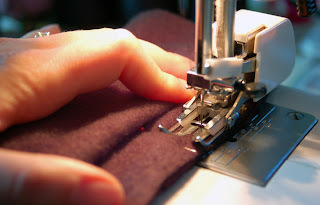 Wind your elastic thread by hand onto the bobbin, if you don't have some on one already. 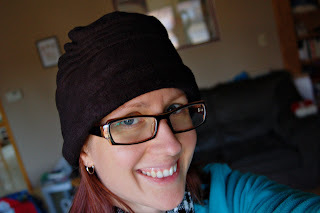 Ideally, if you're making a dark cowl, you'd want to use black elastic. I, however, was going for instant gratification and didn't want to wait until I went to the store. Use the matching thread for your top thread. With your fabric right side up, sew a line of stitching lengthwise, 3" from the edge. Preciseness isn't necessary for this project, so I eyeballed it, but you could also mark the distance on your machine with a piece of masking tape to use as a guide. Make sure you backstitch at the beginning and end or tie the threads together. 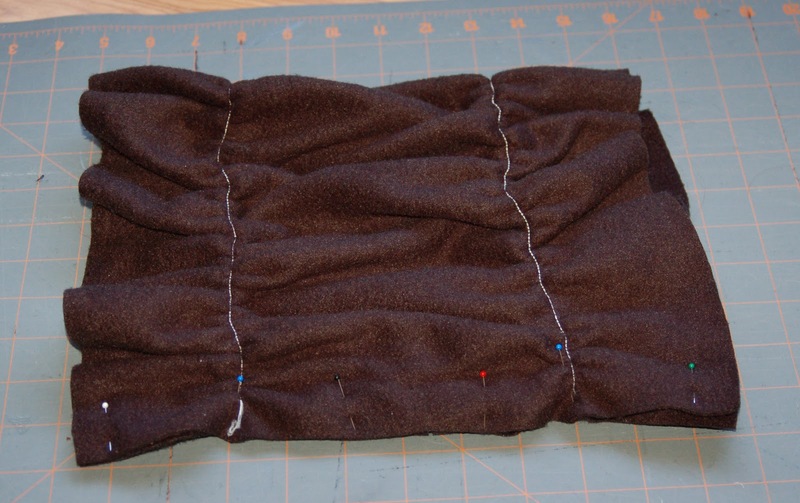 Fold the piece in half, right sides together, and pin along the short edge. 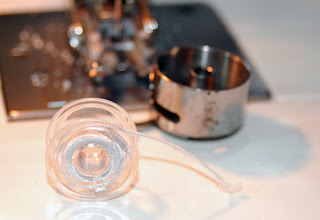 Change your bobbin to regular thread. Stitch. 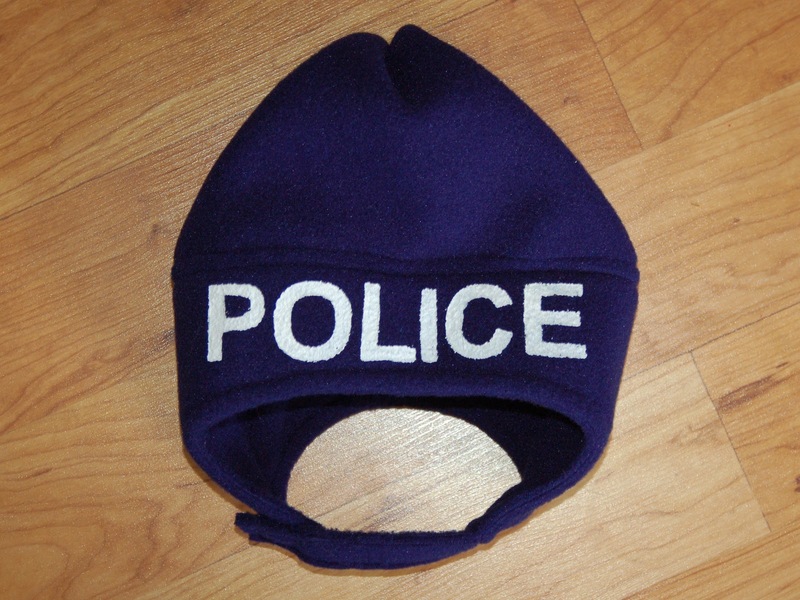 Turn right side out, put it on, and keep your neck warm! See how I stick my tongue in between my teeth when I smile? My daughter does that too. On her it's endearing. On me, rather dorky. 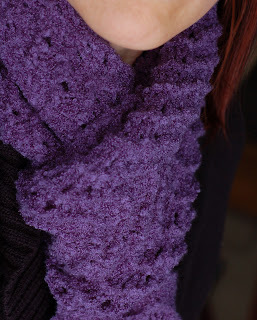 If you try the cowl, I'd love to hear how it works out for you! Whew! 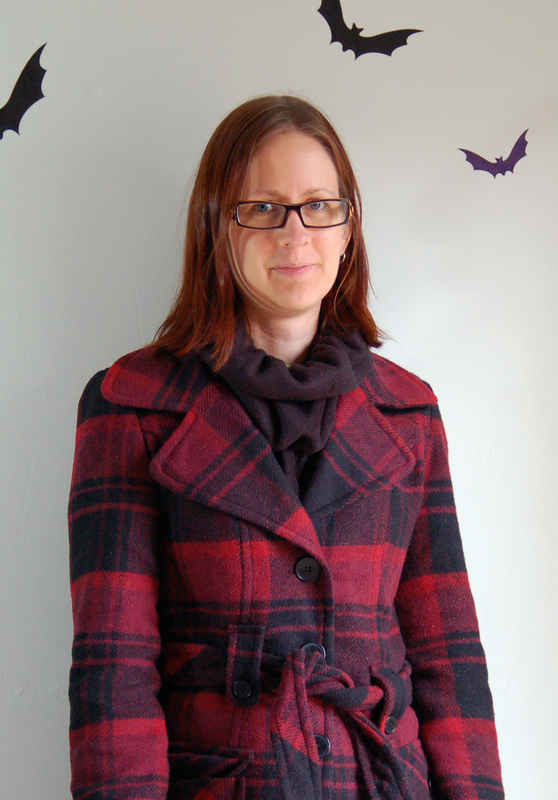 Halloween sewing finally wrapped up at 3:30 pm today! Okay, there are a few things that I said I'd finish up for subsequent years, but the essentials got done. O. and I made this little ghostie. No sewing involved, but lots and lots of coats of various types of starch and stiffening agents. I think he took us two weeks on and off. We rigged up a form like this to shape him. We downloaded the cupcake toppers from here, and O. helped by cutting out half of them, then we hot-glued them to toothpicks. I also made goodie bags for the party guests. (We kept it small, and I'm so glad. Four boys doesn't sound like many, but it one small house, it was quite chaotic!) O. chose the fabrics and wrote out the tags, which I found here. On to the costumes.... E. is still small enough that we get to pick for her. Yay! Her favorite toy by far is a bee, so it was the obvious choice. 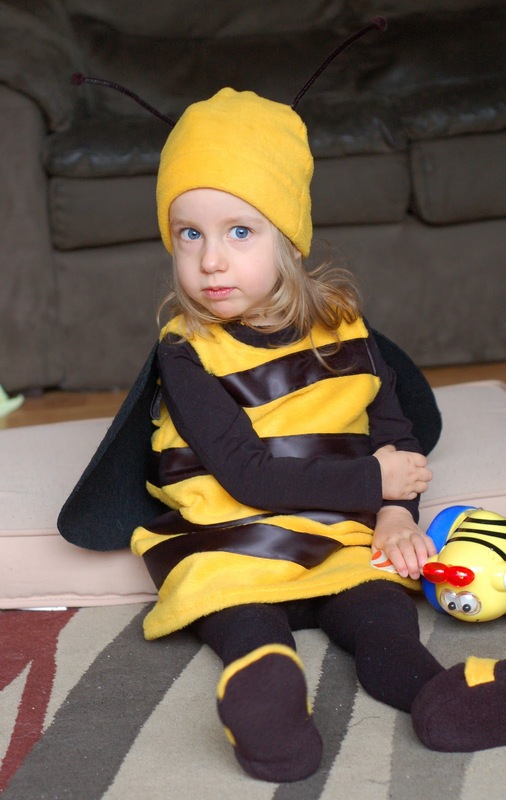 I used the same Nasta Pinafore pattern from Otto 4/08 that I used when she was a ladybug her first Halloween, modified to just pull on instead of buttoning at the shoulders. The stripes are satin ribbon, which I probably wouldn't use again. I made a cone out of fleece for her stinger, and stuffed it lightly, in case she ended up sitting on it. Had I thought ahead, I would've flared out the jumper some more, since she can't stand. It rode up quite a bit when she sat on the floor. I was originally going to make wire wings, but thought it would be too uncomfortable when she was in the stroller or rolling around on the floor, so I used fusible web and two layers of felt, then tacked them onto the jumper. 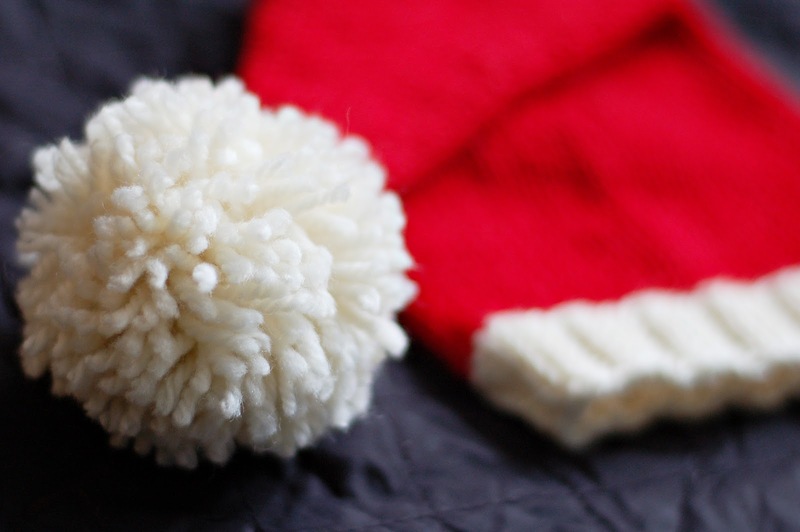 They're a little droopy, but get the idea across. Her hat is from the OOP Butterick 4305, the same as I used when O. was Mike Wazowski, with pipe cleaners that have pompoms hot-glued on. 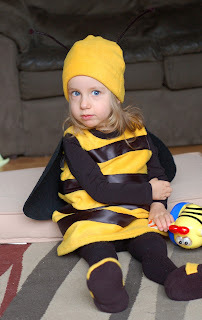 Her bee slippers are from one of my standby patterns, the Darling Diaper Minimocs, which is a freebie. 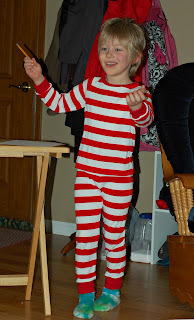 I think the pattern runs a bit narrow, even with E's narrow feet, so I played with it a bit to get a good fit. My first pair was too long (I always forget that her feet are small for her age!) and I also didn't like the narrow satin ribbon I'd appliqued for stripes. I shortened the foot of the second pair and cut a curved piece of fleece for the stripe. Much better! I think I may put them on her for everyday slippers too. 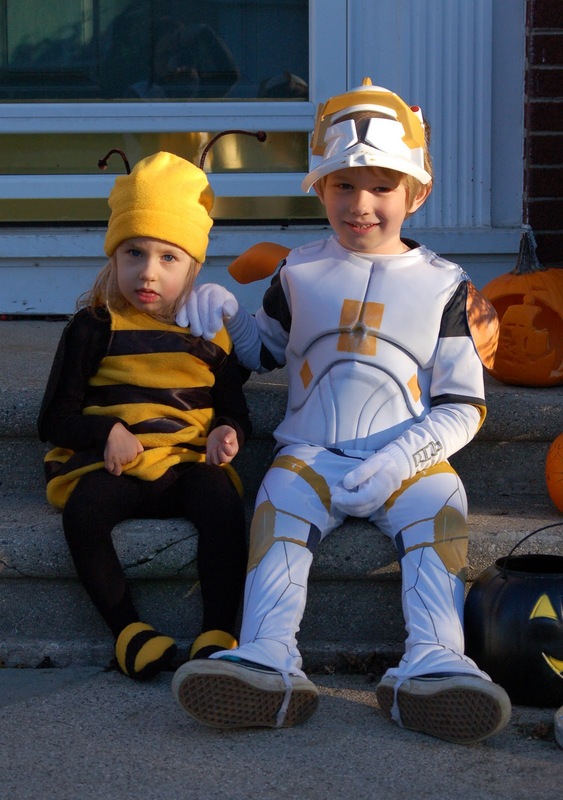 O. wanted to be a clone trooper, which I was not too psyched about. I figured I could modify the pattern for the armor from his knight costume from last year, but when I was looking for a helmet on eBay, I found a great deal for the entire costume, so I bought it. O. requested that the husband also be someone from Star Wars, so he picked Obi-Wan Kenobi. I should have started this much, much sooner, but didn't, so many of the details are still missing. I used Simplicity 5840, and had pretty good luck with it for a Big 4 pattern. I made the cloak first. Wrestling with nearly eight yards of a cheap cotton/poly bottomweight fabric was interesting, to say the least! I didn't stray much from the pattern, other than that the binding of the neck seam didn't work for me as written. I had to trip the seam allowance a lot, and the topstitched it down from the right side, since I didn't have the time or patience to slip-stitch it all. 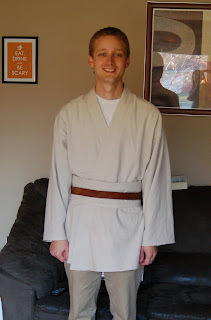 The tunic and belt were made from a much nicer linen/rayon blend. The only change I made to the tunic was to skip the hand-sewing again. 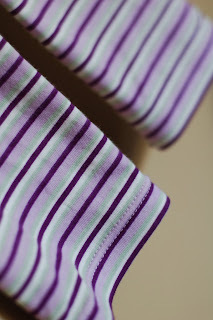 You were supposed to slip-stitch the neckband facing, but I serged the facing and just stitched in the ditch instead. The pattern belt ties, but we wanted to be more authentic, so I made a rectangular belt with hook & loop in the back, then he wore his own belt on top. As soon as I saw Leigh's awesome monster wreath, I knew my five-year-old and I had to make one. 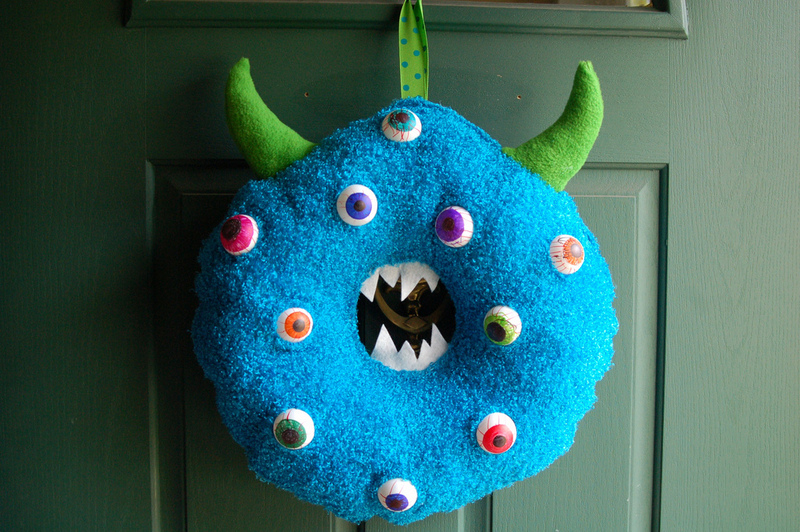 We spent a lot of time looking through this thread on Craftster, and O. wanted to to make one with "ALL the details" shown on the various wreaths. Since I didn't want to spend our *entire* weekend on it, I managed to talk him down to eyes, horns and teeth, with the promise that we may add glasses sometime this week. We bought some ping pong balls and Sharpies, dug some furry fabric from the stash, warmed up the hot glue gun and got to work. I think he turned out pretty cute -- er, scary! One of my favorite little people turned three last week, and as her mom appreciates crafty endeavors, I made her a dress. I love the idea of the Modkid Sydney pattern -- especially the hood! -- but not so much how roomy it appears to be (I don't get why "euro-style" seems to mean "big enough to fit three children"), so I modified the dress to have the fullness of the top pattern. The shirt has you use one length of fabric, so this wouldn't work on the bigger sizes, but since I made a 3, it worked well. 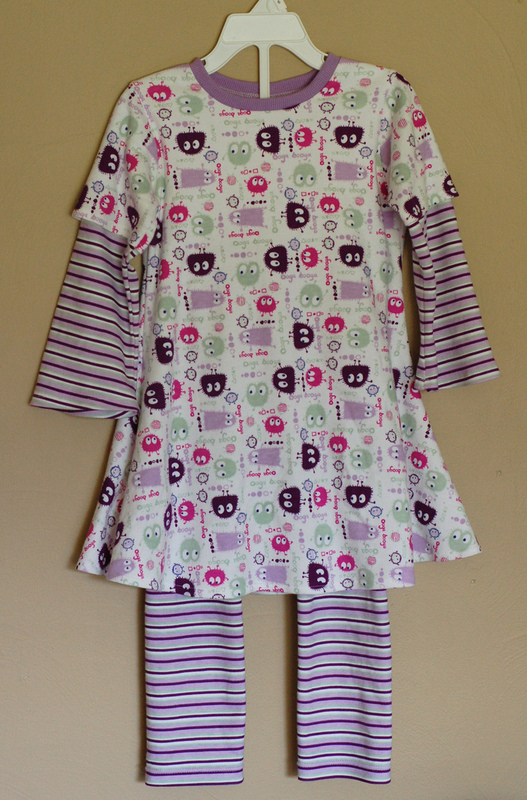 My last project for KCWC was this dress and leggings set for E. I've been hanging on to this purple Ooga Booga print and coordinating stripe for months, and it was time to sew it up! 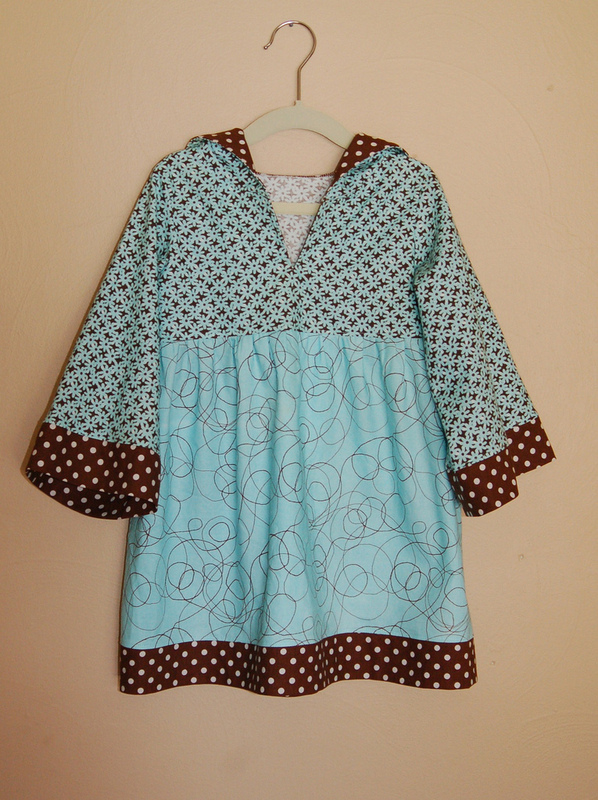 The dress is the Farbenmix Olivia underdress without the hood or pocket. E's tall and thin, so I added an inch of additional length to the size 86/92. I was really excited at how nice my hem with the twin needle turned out! I've tried it less successfully in the past, but read to use Wooly Nylon in the bobbin, which made a huge difference. I'll definitely be using that often.